Have I shared my secret for naming patterns? Street names. If I had only a street map of Jacksonville, I would have names for all the patterns I could ever design. Dugdale is one such street name. To me it just screams little dude in something cute. It's kind of a little old man sort of sweater. I can almost see a little guy wearing it for Halloween and hollering, "You kids get off my lawn!" With a cane to shake. See how the buttons make the look? I got these at Joann's - so they are widely available. The Dugdale Sweater is knitted up in the softest machine washable blend - Vintage by Berrocco. 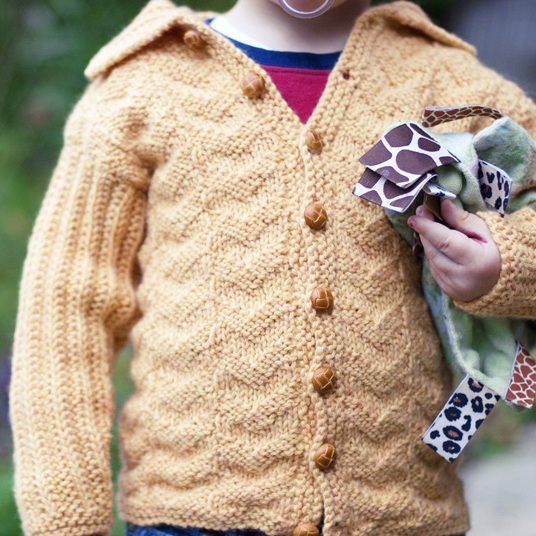 And it's available in the newest issue of KnitCircus - the 2011 Gifts Issue. But it gets better. The Dugdale Sweater has a matching blanket! It's worked up in the same squishy chevron and rib pattern with garter edges so the blanket is completely reversible. It's also made out of Berrocco Vintage, which is as soft as can be for little ones, but washes like a dream, and wears like iron. Did I already use the phrase "it gets better"? I did, didn't I? Hmm. I need a bigger phrase, a wow, a woo-hoo kind of phrase. Can I just holler contest? Because knitters surely like a contest. Well anyhow, here's the little contest. Because KnitCircus is awesome, I have some issues to give away. And all you have to do to be entered in the drawing is comment. But you have to answer my silly question. And the question is... What is your quest?!?!?! No really. The real question is... What is your favorite Halloween candy? The drawing will take place Monday morning, 10/17. So comment away and enter to win a free e-copy of the KnitCircus Gifts Issue. You know you wanna!